Enjoy the flexibility of combining the Swamp and Bayou Tour and the Oak Alley Plantation Tour and SAVE! Travel across the Mississippi by coach for a boat trip deep into the Louisiana bayou and experience a bygone era at At Oak Alley Plantation. Important Note: Tours must be taken on different days. At checkout, select the date of your Swamp and Bayou Tour and then fill in the date you want to take the Oak Alley Plantation Tour in the special requirements box. Swamp and Bayou Tour: After a short motorcoach ride across the Mississippi River, take a boat trip into the swamps and bayous to experience the timeless beauty of Southern Louisiana. Native guides will reveal the mysteries of the swamps and bayous and the Cajun "joie de vivre". Hear how Cajuns turned soup into gumbo, the washboard into a musical instrument, and the swamps of Louisiana into a paradise. See the nesting grounds of alligators, egrets, raccoons, nutria, and snakes. Be treated to a Bayou Nature Wildlife Show by a local naturalist with snakes, alligator snapping turtles, and raccoons among the animal guests. Learn about the efforts made to preserve and restore Louisiana's vanishing wetlands. Tour is approximately 3.75 hours. Oak Alley Plantation Tour: Feel the gentle breeze of Southern hospitality on a tour that takes you back to the glory of the Old South! 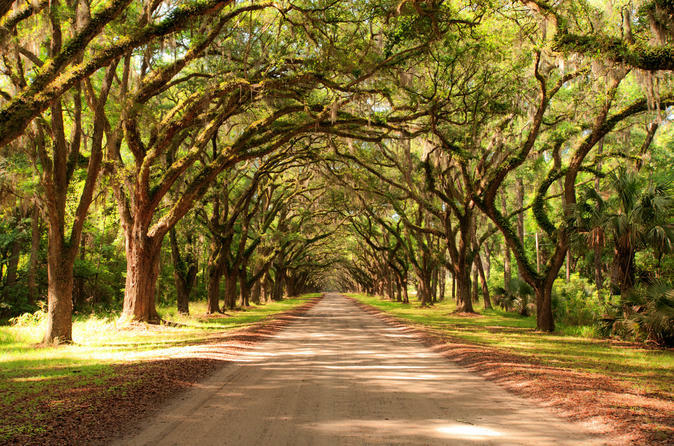 Marvel at the unbelievable quarter-mile long alley of 28 oak trees, each over 250 years old. Perhaps the most photographed plantation ever, Oak Alley, built in 1839 has been the setting for such motion pictures as "Interview with a Vampire", "Primary Colors" and the daytime soap opera, "Days of our Lives". Your guided tour will reveal the fascinating stories of the home and its history. View the majestic cypress trees in Louisiana's swamps bordering the Mississippi River. You can purchase a snack in the cafe and ice cream parlor to enjoy at the picnic tables (not included). Tour is approximately 4.5 hours. Special Offer - Book this tour and save 4% compared to booking each attraction separately! - Book Now!